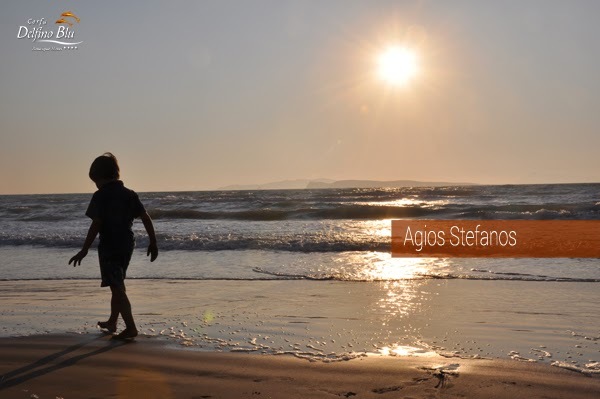 Agios Stefanos (San Stefano) - A Popular laid-back beach resort set in a rural hillside location. Agios Stefanos is a quiet and relaxing holiday resort, 35 km from Corfu Town on the northwest side of the island. Right on the Cape of Kefali, it offers fine views of the Diapontian Islands of the Ionian Sea and is home to an outstanding bay and a coastline of extensive golden sandy beaches, lapped by shallow turquoise waters. Agios means ‘Saint’ in Greek, so you might see it referred to as Saint Stefanos too. It is a great choice for families with children as it is protected from the elements and considered very safe. The beach is well organised with sun beds, bathrooms, showers, a playground and lots of watersports on offer. The original village of Agios Stefanos, a home for years to fishermen and farmers is grouped around the church on one side and the old harbour on the other. Many beach bars, taverns, restaurants, supermarkets and a lot of souvenir shops are located right along the beach in Agios Stefanos village. There’s a modern style resort too and port area that provides bars, shops and restaurants within walking distance. The airport is just 35 km away, but the rural backdrop makes it feel worlds apart. It’s an ideal location for leisurely walks and it’s a great location for day trips to nearby Sidari or Corfu Town. It’s also a top choice for day trips or longer cruises to the nearby islands of Kefalonia, Lefkada, Paxos, Antipaxos and the rest of the Diapontian islands. No matter where you stay, renting your own boat is a must. You can view the island from a different perspective, visit secluded, practically private beaches, stop for lunch at a hidden taverna or soak up the sun on deck.